After an exciting trek to Everest Base Camp and an ascent of Island Peak the Sellers Family adventure will find us next in the region of Mustang; an ancient and mysterious place. The Mustang trek begins in Kathmandu and will take us to the Kingdom of Lo Manthang. Travelling along the same route that was taken by tradesmen 700 years ago, we will find the small villages untouched by modern civilization; we will even make a visit by horseback to the mysterious and ancient Sky Caves of Nepal. 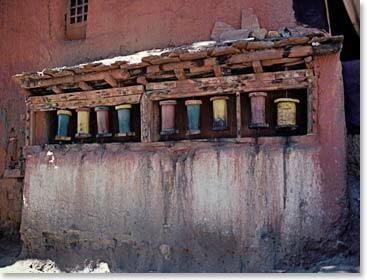 After the Sellers have had the chance to explore Mustang they will make our way to Tibet to explore the brilliant and fascinating city of Lhasa. Follow these daily dispatches as the Sellers Family embark on this unforgettable adventure. November 20, 2013 – Happy Birthday Keely!